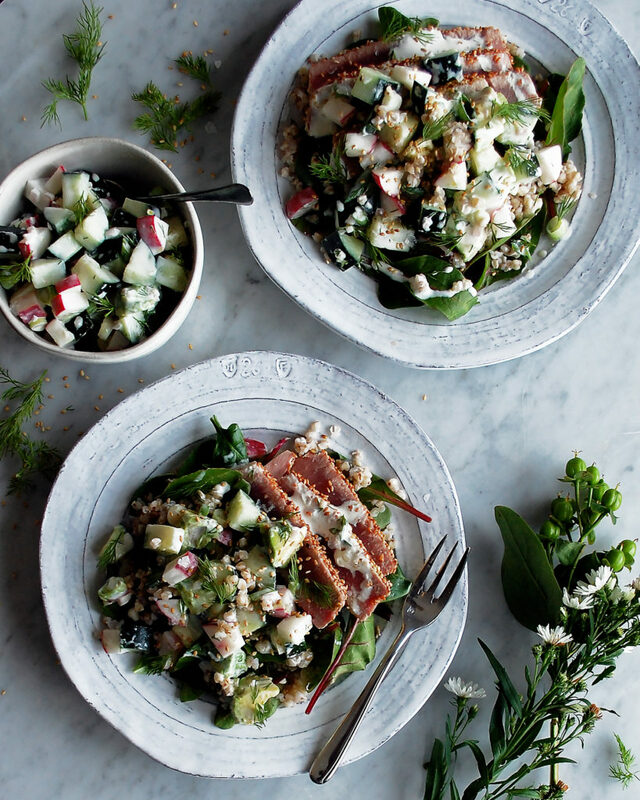 This sesame crusted tuna & buckwheat salad is tangy, refreshing, and makes for the perfect mid-week meal. I don’t eat tuna often, but for some reason I was craving a seared tuna steak with lots of fresh flavors. I think one of the best ways to brighten up these cold winter months is to eat a few meals a week that are light and crisp, balancing out all the cozy, hearty dishes (like my favorite French Onion Soup that I’ll definitely be making this weekend). 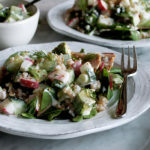 This salad has a little bit of everything, and I’ve been loving it as a light lunch this week. We’ve got tuna for protein, buckwheat for a nutritious grain (I used Bob’s Red Mill Buckwheat Groats), yogurt for lots of probiotics, and a bounty of vegetables for… you know, your good daily dose of veggies! I love how tangy the yogurt dressing is. I dice all of the vegetables and stir them right into the dressing to make like a chunky sauce to spoon over the tuna and buckwheat. This “salad” is mainly made up of the main ingredients I just mentioned, but I do throw a small handful of mixed greens on the plate as a base. Fresh dill adds a unique bite and helps round out all the flavors. Make sure to season the dressing and tuna well so that all of the flavors really come through. Other than that, this is super easy to throw together (I made it one morning in like 20 minutes). The best part about using buckwheat groats, too, is that they cook in no time, just about 10 minutes once simmering. Combine the buckwheat groats and water in a small saucepan. Bring to a boil over medium-high heat. Reduce the heat to low, cover the saucepan, and simmer for about 10 minutes until the buckwheat groats are tender. Drain the buckwheat in a fine mesh colander. Run under cold water to chill the buckwheat, drain well again, and set aside. In a mixing bowl, whisk together the Greek yogurt, lemon zest, lemon juice, sherry vinegar, and extra virgin olive oil until smooth. 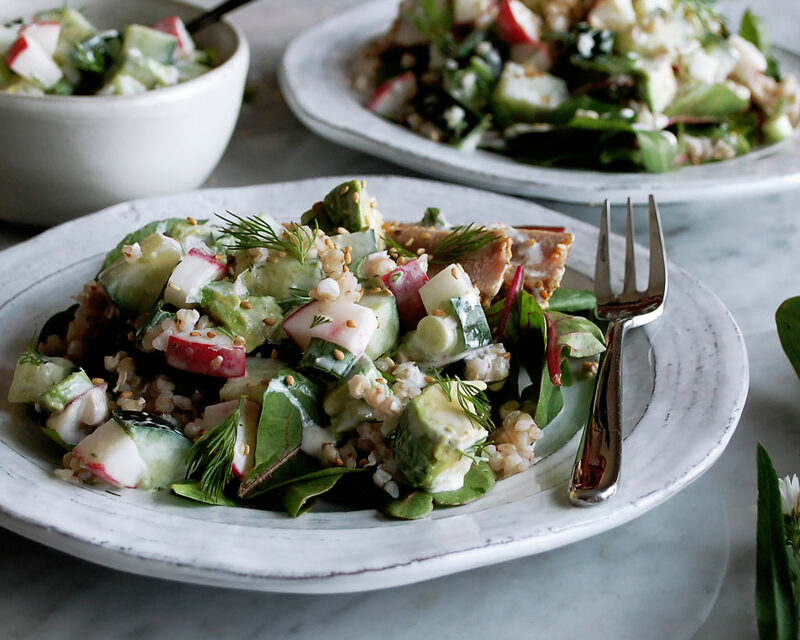 Stir in the cucumber, radishes, shallot, green onions, avocado, and dill. Season with salt to taste. Season each tuna steak with salt on both sides. Add the toasted sesame seeds to a large, shallow bowl. Press each tuna steak into the sesame seeds, coating each side well. Make sure to press firmly so that the seeds stick. Heat a large sauté pan over medium-high heat. Add enough oil to coat the bottom of the pan. When the oil is hot, place the tuna steaks into the pan (work in batches if you need to). Sear the tuna on one side for about a minute. Flip the tuna over and sear on the other side for another minute. This will create a seared exterior and raw interior, which is how tuna is best served. Remove the tuna from the pan. Slice each steak into thin slices against the grain. To serve the salad, place a small handful of mixed greens onto each plate. Top with a heaping spoonful of buckwheat groats and a portion of seared tuna. 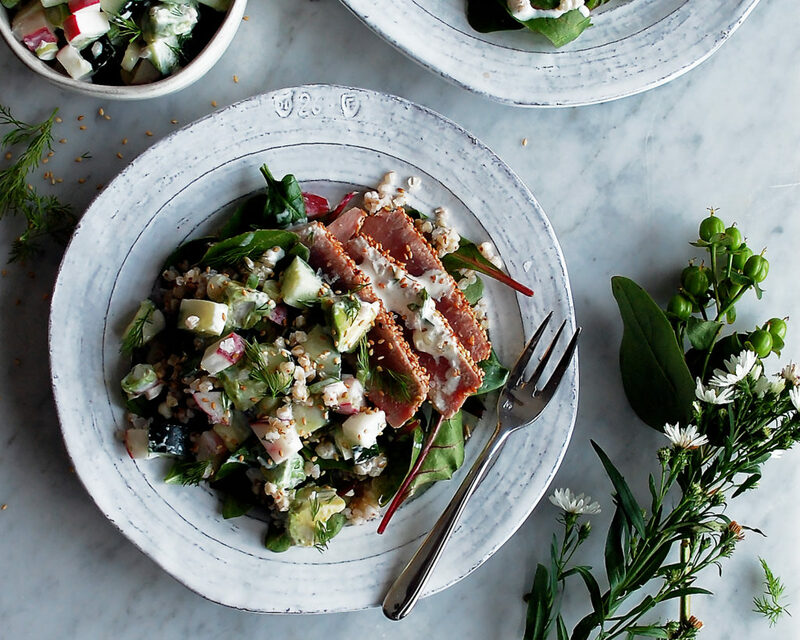 Spoon the cucumber yogurt dressing over top and garnish with more toasted sesame seeds. Yum! This does look super refreshing. Just what I’m missing this winter. & stunning photos! Thanks so much Rachel!! Yes exactly what I needed, too!